Tokyo seems super safe. For the most part, it is. 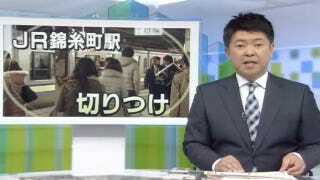 But be careful, there are some dangerous folks out there: NHK is reporting that this week in Tokyo, a 39 year-old man accidentally bumped the arm of a fellow portable game-playing passenger while riding the Sobu train line. That escalated into an argument, and when the man got off the train at Kinshichō Station in Tokyo, he was slashed in the back by the passenger, who apparently wielded some kind of small blade. The injury, thankfully, was not serious. The report didn't specify what kind of portable game or device the man was playing, other than calling it a "portable type game." Police are now checking security camera footage in hopes of catching the suspect. Remember, video games don't make you violent. Being a violent person does.